No one trades to lose money. Hence, trading in the share market should be seen as an investment and not as speculation. No one trades to lose money. Hence, trading in the share market should be seen as an investment and not as speculation. A smart investment is an investment that promises safety of the principal invested along with adequate returns. This can be achieved after a thorough analysis of the company one wants to invest in. The difference between speculating and investing is that the latter requires extensive research on the company one wants to invest in to avoid losses. On the other hand, speculation is similar to gambling, where the trader hopes that the price of a stock he bought will rise without even considering the financial statements of the company. You have to be selective with your equity investments. 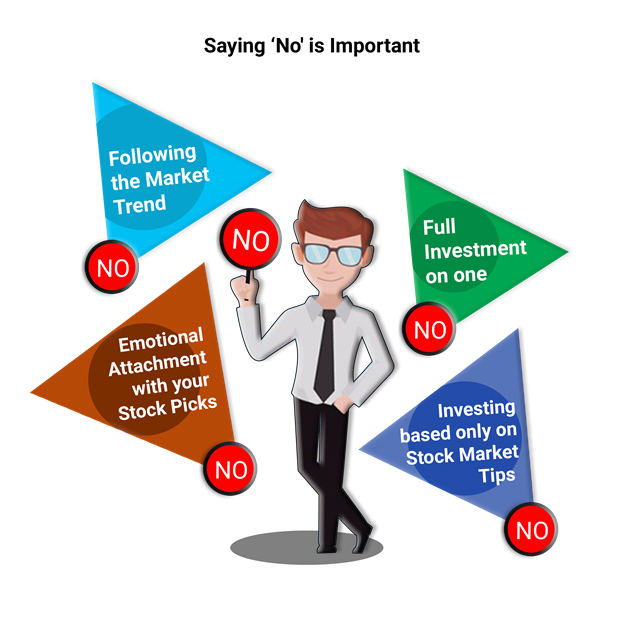 Saying ‘no' to the stock of a business you do not understand is an essential trait of an intelligent investor. Financial experts advise not to invest your entire corpus in a single investment vehicle. Instead, diversify your portfolio with stocks of different industries/sectors through various investment methods, i.e., stocks, mutual funds, and so forth. Following this advice ensures that all your picks do not end up in the red at the same time. This is because it is doubtful that all industries/sectors/ will become negative at once, and hence, it would be best if you were invested in a few, or more, of them. Spread out your investments, and play safe with a diversified mix of sectors and methods to keep your portfolio afloat during bad times and reap better returns in the long-term. One of the best traits of an intelligent investor is that he/she accepts his/her wrong trades and moves on with it. You need to monitor and notice the developments of and around your investments continuously. If stocks are taking the wrong direction, you will sometimes need to book losses and come to terms with it. Don't fall in love with your stocks, sell them if the fundamentals do not appear correct and restrict your losses. Booking losses at an early stage can help minimize them. Apart from this, stocks that are in some hot 'Buy' lists can be considered a good place to start your research and analysis. However, remember never to buy a stock just because it takes a spot in these lists as it could turn the odds against you. Following the market trend does not yield good returns in the long-term because the market or the company you have invested in could take the downward route even before you realize it, and a majority of your portfolio would turn into red causing a situation of panic. Predicting the markets or correctly catching its fluctuations is an almost impossible task. Therefore, say ‘no' to investing based only on stock market tips or rumors. Also, say ‘no' to attempt catching the market bottom and top. Buying stocks of companies that are in the hot lists of the 'best stocks to buy', or on stock market tips, or rumors can be considered a good place to start your research and analysis. However, remember now to buy a stock just because it takes a spot in these lists as it could turn the odds against you. Following the market trend does not yield good returns in the long-term because the market or the company you have invested could take the downward route even before you realize it, and a majority of your portfolio would turn into red causing a situation of panic. Predicting the markets or correctly catching its fluctuations is an almost impossible task. Therefore, say ‘no' to investing based only on stock market tips or rumors. Also, say ‘no' to attempt catching the market bottom and top.